Please note that the video below is of the old model. A video of the new model will be uploaded soon. Enjoy a new degree of mobility. With e-fix, the electrical add-on drive for your wheelchair, you can cover longer distances quickly and easily. The conversion is so easy: your specialist dealer will simply swap the drive wheels and install the battery pack and control unit - all done. The motors are neatly concealed within the wheel hubs. Almost all current types of wheelchairs can be retrofitted with e-fix in this way. This means that you can continue to use a wheelchair that has been optimally adjusted to suit you. e-fix takes you effortlessly to your destination: whether in the house, while shopping, or when travelling by car. Stay flexible - two wheelchairs in one! 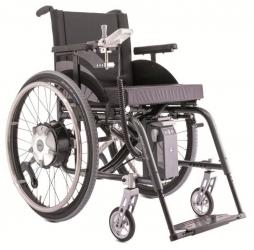 The e-fix is also very easy to push by hand if the situation requires it: just uncouple the drive wheels with a simple move- ment and your wheelchair can be propelled manually in the usual way – either by using the push rims or by another person pushing. is easy to operate. The lower the speed selected, the more manoeuvrable the driving behaviour. You steer and the e-fix thinks for you! In addition, the compact control unit offers you excellent comfort. Its clear, colour display shows all the important information, such as battery capacity and speed, at a single glance. And if you so wish, you can adapt the e-fix to your personal requirements using the intuitive menu navigation. Moreover, additional smart features are included, such as integrated peripheral lighting*, which illuminates your path in the dark. At only 2 kg, the battery pack of your e-fix is extremely light, and at 8 cm wide, exceptionally slimline as well. Thanks to its cleverly-designed battery mount, one hand is enough for installation and removal. Most folding wheelchairs can even be folded up with the battery in place. The two quiet yet powerful drive units make e-fix an ideal companion both outdoors and inside. Turning on the spot and manoeuvring in confined spaces, or safely and powerfully negotiating slopes**, neither are a problem for e-fix. * country-specific road traffic legislation must be observed. Configure e-fix to your individual needs. e-fix can be adapted to your requirements - whether gentle or sporty: The drive unit can be individually programmed. In this way, its driving characteristics can be tailored to suit you. The control unit can be attached to suit both left-handed or right- handed individuals. With the option of heavy duty drive wheels with more power, e-fix can be used by people weighing up to 160 kg. The optional available intuitive attendant control makes the e-fix a perfect push- and brake aid for your companion. There is a comprehensive range of accessories to make life easier for you and to provide more comfort. An exceptional product can be recognised by its clever details. Weighing 2 kg, the small lithium-ion battery pack is especially light and easy to handle. Its long life and 24-month manufacturer‘s warranty offer all-round, reliable power on the go. Thanks to the EasyConnex magnetic plug system, the control unit and battery charger are easy to connect. The automatic contacting of the battery in the innovative battery mount is especially helpful during everyday use. Low weight, no tools necessary. To load, just undo the quick- lock release fasteners and remove the e-fix components from the wheelchair. No part weighs more than 7.8 kg and everything finds space in the back of any car. Your e-fix is just as quick and easy to reassemble when at your destination. e-fix can be relied on. e-fix is a product of Alber, the specialist in highly portable and user-friendly mobility aids. Independent institutions have tested and positively evaluated the longevity, quality and robustness of the e-fix. Alber products are manufactured to the highest standards and are tested independently by TUV - the German standards authority, in accordance with the latest guidelines for medical devices. Can I use e-fix on my wheelchair? The e-fix can be used with most models of wheelchairs. Brackets to attach the drive wheels are fastened onto the frame of the wheelchair. The manual wheels for your wheelchair can normally still be used. How fast does the e-fix travel? You can continuously vary the maximum speed of the e-fix between 0.6 and 6 km/h (0.37 to 3.7 mph). Thus you can find your optimum travelling speed in safety. The handling can be adapted in detail by your dealer to suit your individual needs. How many versions of e-fix are there? 120 kg (264lbs) The optionally available reinforced wheels with a higher rating can be used with people up to a maximum weight of 160 kg (352lbs). The standard version of the e-fix has wheels of size 22” or 24”. "Will e-fix help my attendant too?" Yes! The holder that is available as an accessory allows the control unit to be installed on the push handles of the wheelchair. The optional intuitive attendant control makes it easier for the attendant to push the chair. Is the e-fix only intended for "self-drivers"? No! 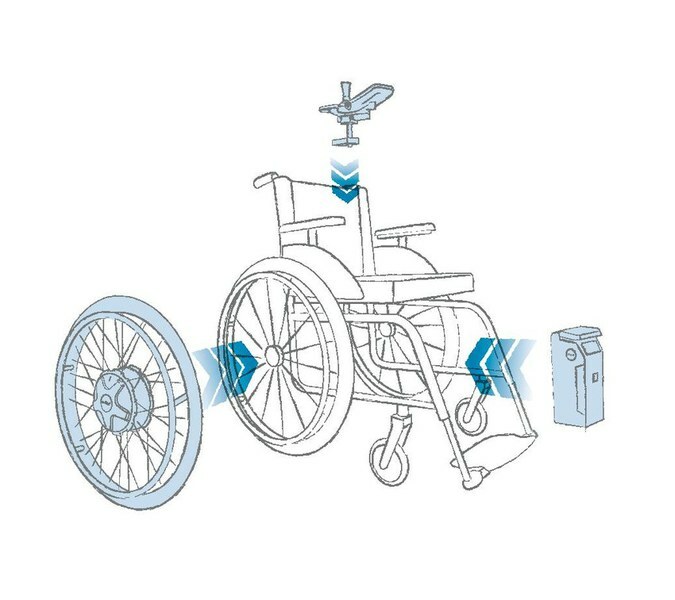 The holder that is available as an accessory allows the control unit to be installed in the push handles of the wheelchair. The e-fix thus makes it easier for the attendant to push the chair. The intuitive attendant control (accessory) makes operation by another person really easy. How far can I travel with one charging of the battery? Depending on the weight of the person, the sort of terrain, the temperature, the wheelchair settings and the surface of the ground, one charging of the battery is good for up to 16 km (10 miles). You can increase the range up to 22 km (13 miles) with the optionally available high capacity battery pack. Alternatively, an additional spare battery is another simple solution to increase the range. How steep a ramp or gradient can the e-fix cope with? Can the e-fix also be taken into a car? Yes! The modular structure makes it possible. All the e-fix components can be easily removed from the wheelchair without needing any tools, and hence save space when loaded into the back of any car. Your wheel- chair can still be folded up. How much does the e-fix weigh? How much wider does my chair become ? What accessories are available for the e-fix? Anti-tippers with a swivelling and jack-up function to make it easy to remove the drive wheels, Swivelling arm to allow you to get closer up to tables, various types of attendant controls to optionally allow the e-fix to be used as an aid to pushing, and much more. * Weights may vary depending on the wheelchair, accessories and the suitability of the person operating the device. With automatic swivelling function to overcome kerbs and thresholds. Jack-up function for easy removal of the drive wheels. Anti-tippers must be installed in pairs. The original wheelchair anti-tippers may be used. Mounted onto the wheelchair pushhandle tubes. Position can be adjusted individually. Control unit for the attendant is simply inserted. Can be fitted on the left or right-hand side. Changing from 12 mm Ø to ½" stub axles. Conversion consisting of hubs, spokes, quick release axles, adapter, fittings. Available for normal standard hubs and drum brakes. Conversion of existing quick release wheels from 12 mm quick release axles to ½" so that e-fix and manual wheels fit onto the same wheel adapter. Protects hands in case of collisions. Robust construction to protect the joystick. Enable you to drive up really close to tables. Minimum height above the e-fix wheel 6cm. The controller is inserted into the tray table either in the middle or in any desired position. Ergonomically shaped T-handle for tetraplegic. Foam rubber ball 70 mm diameter with large hand support area. Larger joystick ball, plastic, diameters 40mm and 50mm. Also useful for the workplace. Simple and ergonomic operation by the attandant. Very robust construction, the angle can be adjusted. Also suitable for use on uneven terrain. Opti-Box is required for the connection. A simple bracket connected to the power distribution unit is installed on the wheelchair frame. The manual wheels are removed and the e.fix wheels are "plugged in". (Existing manual wheels may be interchangeable with the e.fix drive wheels.) With a turn of the wheel hub, users can choose between manual and power operation. The joystick controller is mounted to the wheelchair frame, this component is quick release for easy removal. The nylon battery pack is attached using Velcro straps. The power distribution unit plugs into the face of the battery pack as it sits in the pouch. To fold the wheelchair, only the battery pack needs to be removed. Small - light – swift. Converts a manual chair into a lightweight power wheelchair. Easy to dismantle and ideal for transporting. Fits to almost every wheelchair. 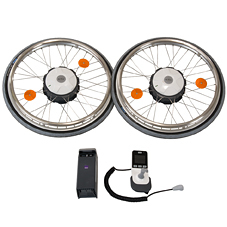 Your wheelchair is simply retrofitted with the e-fix components – and you’re ready to drive. Power add-on drive e-fix ideal for transportation. No single component weighs more than 9 kg. Free Fitting Service Available Depending on Location.